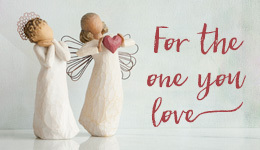 This special Willow Tree® angel figurine stands holding a simple tea pot in her hands depicting a special friend and one whom you share warm comforts between. A wonderful idea for a special friendship that you've shared. Personalize with a first name written in a vertical presentation along her skirt. Includes gift box and ready for gift giving. Easy care: Dust with soft cloth or soft brush and avoid water or cleaning solvents. Sweet Sentiment of "Hold Close That Which We Hold Dear"